Our North Park gift shop is perfect for the cinephile in your life. We have new products arriving weekly for all occasions. Get your favorite movie soundtracks on vinyl, movie/television themed board games, unique greeting cards, blu-rays and more here at the Digital Gym Cinema! 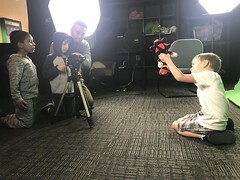 MACSD is a charitable organization dedicated to engaging youth in self-expression via new technologies, so all purchases directly benefit Media Arts Center San Diego’s programming. Open Daily 11AM-9PM. Located at the DIGITAL GYM CINEMA at 2921 El Cajon Blvd., San Diego, CA 92104 (off 805 Freeway on El Cajon Blvd. On the corner of 30th St and El Cajon Blvd in North Park).